Working with the Chicago Architecture Foundation, we crafted a strategy for expanding their design education platform, DiscoverDesign. The Chicago Architecture Foundation started DiscoverDesign in 2012, providing an online extension of their successful textbook “The Architecture Handbook”. 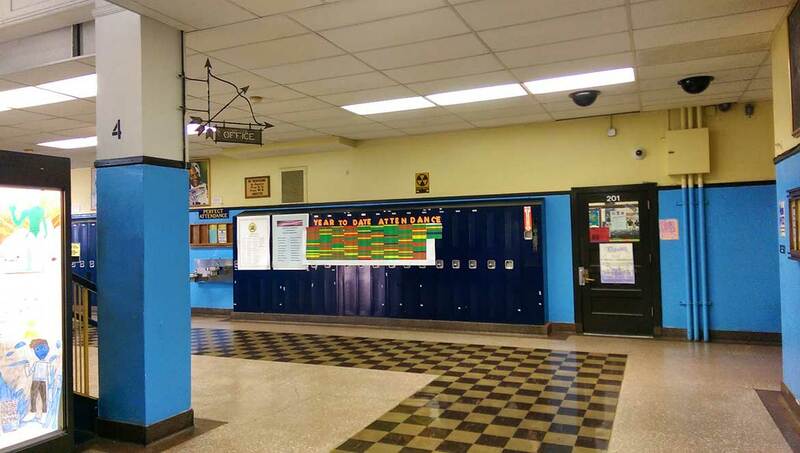 DiscoverDesign provides design projects for teens, focusing on designing around familiar subjects such as school cafeterias, lockers, or teens’ own environments. Since its inception, DiscoverDesign has seen many projects completed, and has proven to be a great resource for teachers in design and architecture classes who use the projects as part of their curriculum. Wanting to expand their user base, and in particular attract students who haven’t yet expressed in interest in design or architecture, the Chicago Architecture Foundation engaged Fuzzy Math to help plot a course for the future of DiscoverDesign. 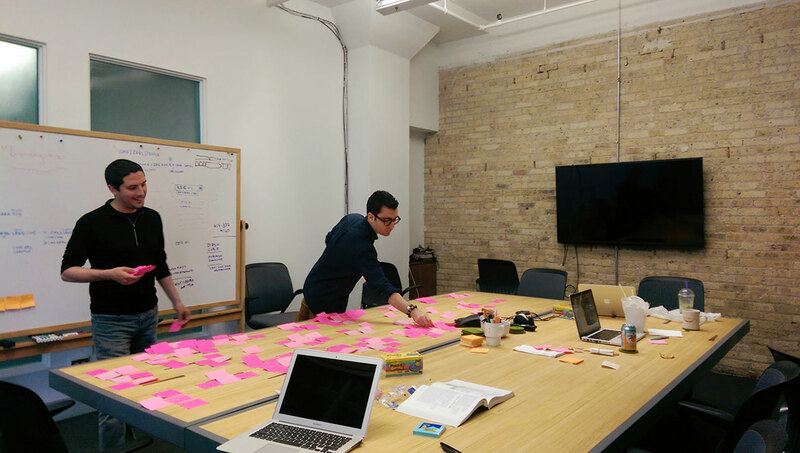 Through design strategy and service design, Fuzzy Math worked with Chicago Architecture Foundation for four months to develop a robust roadmap to reach their goals for new users. But first, we needed to understand the users – the teens and teachers who we wanted to start or continue to use DiscoverDesign. Alongside Chicago Architecture Foundation staff, we went to Chicago-area high schools and after-school programs to speak with teachers, students, and coordinators to help uncover how classes are operating today and how DiscoverDesign could fit within existing curriculum in a way that’s both engaging to students and useful to teachers. We also conducted remote video-interviews with teachers and students who currently utilize DiscoverDesign to learn more about how it’s being used today. Finally, we surveyed teachers and students who had previously used DiscoverDesign, as well as teachers who were just starting to engage with the Chicago Architecture Foundation on design-oriented course material, to help further our understanding of the needs of students and teachers. Once we felt we had a strong understanding of our users’ goals and needs, we combed through our research and started pulling out themes. Some findings fell in line with our expectations from high school students, such as the directive to “Make it cool”, while others were a bit more surprising – many of the high school students we spoke with cited interest in community gardening and a resounding desire to work on projects which would directly benefit their family and community. Throughout the research process, as well as the research synthesis process, we collaborated with key stakeholders from Chicago Architecture Foundation, providing their team with a deeply informed user champion, and allowing our teams to move quickly and build off each others’ knowledge. Building off our research and the opportunities identified, we collaborated with Chicago Architecture Foundation stakeholders to rapidly concept ideas that could push DiscoverDesign forward and help attract new users. We landed on a major shift in ideology surrounding DiscoverDesign: it’s about the teachers. At its core, DiscoverDesign is an educational tool, but up to that point Chicago Architecture Foundation approached it from a perspective of getting students involved. But the sort of highly engaged, self-motivated student who would seek out DiscoverDesign is a rarity – many such motivated teens instead were focused on projects that felt less tied to school. Rather than strain to reinvent DiscoverDesign, and attempt to maintain it’s educational leanings while appealing to students seeking a non-school experience, we saw an opportunity to double-down on the success many teachers had already found using DiscoverDesign. This allowed Chicago Architecture Foundation to not only continue building off existing tools, but also to build off existing relationships with educational organizations, and to attract students by the classroom – each teacher is likely to bring 30+ students per year into the tool. With the overarching strategy in hand, we focused our efforts on concepts that would better attract and empower educators. Our plan emphasized an expansion in the spectrum of projects offered, extending beyond their current focus on the “built environment” to topics more approachable to teachers without any architecture background. These projects would also need to represent a broader range of effort, including “quick win” projects that can be completed within one or two class periods. These quick projects would give students a sense of satisfaction in completing a project, and also allow teachers to test out DiscoverDesign without a substantial time investment. Finally, we identified a set of teacher-oriented tools that could be built into the DiscoverDesign system to increase its efficiency as a classroom tool and make it more appealing to educators. We vetted these ideas with teachers, who helped validate that our proposed strategy made DiscoverDesign a more powerful tool for their classroom and their students. We presented our vision for the future of DiscoverDesign to Chicago Architecture Foundation executives. Knowing that institutional buy-in was crucial, we met with other team members at Chicago Architecture Foundation who would be impacted by any forthcoming changes, reviewing our findings and concepts with them to ensure the organization had a holistic understanding not only of what would be happening, but also why those changes were suggested, and the users who they are targeting. 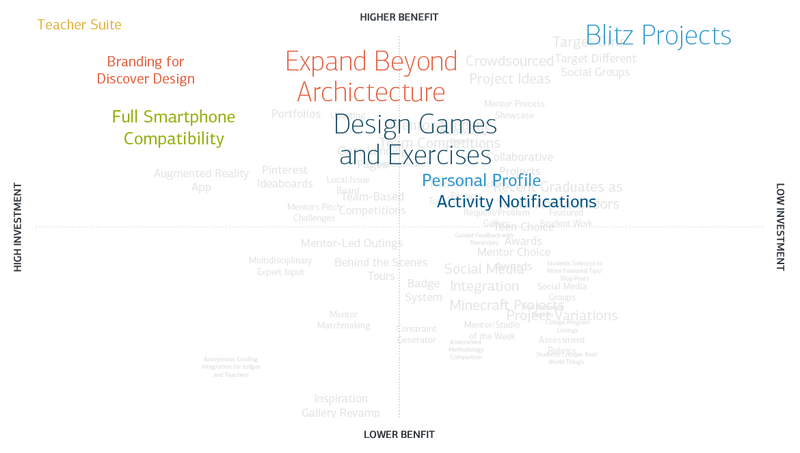 Feature and concept prioritization matrix.